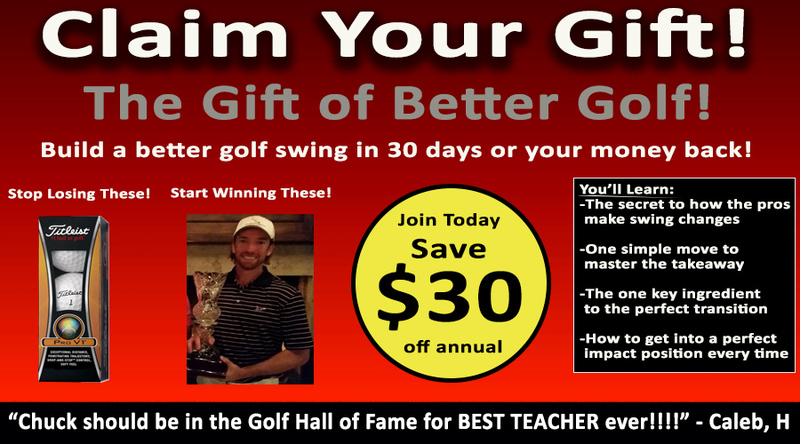 Want more lag in your golf swing? The Orange Whip lag drill by Chuck Quinton, RST Founder, will show you how to easily produce incredible lag immediately in your golf swing. Using the OrangeWhip golf swing training aid helps exagerrate the feeling of having a proper amount of lag in your swing due to the flexing of the shaft and the weight on the end. Combine this simple golf training aid with Quinton's golf swing drills and you'll build a powerful, efficient and effortless golf swing. Hey guys. As you know, rotary swing is all about teaching you how to work with the laws of physics in your golf swing, and of course, something you don't want to try and work against. One of the little training aids that I developed, or just put together in my garage, is to help illustrate of the feeling of maintaining lag and properly releasing lag, is this little stick and ball. This stick, because it's got a steel cable on the end of it, as I go back to the top, if I don't push against the shaft, this ball and this string will lag behind. I'll have this angle to this point in the swing. Then at this point, I want to post up on my left leg and let that release, instead of trying to push it through or do any of this crazy stuff, or heaven forbid, throw it from the top, like most every golfer wants to do, and push against the shaft with my right arm. And then all of a sudden, this ball's out of control. I want to feel like it lags behind, and then at the bottom, it snaps, and I really let it release. Not everybody has one of these, and I'm not going to make one for all you guys. It's too much work. But I did find a training aid that illustrates this same concept perfectly. It's called the Orange Whip. Some of you guys have asked us about this. We wanted to test them out and have found out it works perfectly with that visual that I'm trying to illustrate in my video about how to maintain lag and release the club. Working with the laws of physics, this thing helps you feel what that feels like. What it should feel like is, when you go to the top of the swing, when you combine this with our body rotation and our lead arm drills, the club shaft, or this shaft, should bend and be stressed at the top of the swing. It should bend back. If you do what most every golfer on the planet does, and push against the shaft with your right arm and your right thumb, or your left thumb, this thing's going to let you know about it. You're going to feel it right away, because as you go to start down, and you do this, all of a sudden this thing becomes really unwieldy. This is what's happening with your real swing. You just don't feel it, because it's not as exaggerated. But this helps you illustrate or feel it perfectly, versus what you would feel just with your golf club, because most every golfer does this. They widen the angle, and then they scoop it, and chicken wing it, and all that stuff. This helps you feel what it feels like to keep the shaft stressed on the way down, and then more importantly, proper release of that stress shaft. Do this lead arm only, start down, and as you start down, at this point, the shaft will still be bent backwards, and then you want to post up on that lead leg, and let this release. You want this energy of this shaft being stressed and bent back to release. You don't want to keep pushing it through. Here's the ideal feeling for a proper swing release. You want to feel like this orange ball is pulling you into the release instead of you pushing the ball into the release. The club head and the real swing should feel like it pulls you around to a follow-through, because you released that energy, versus you trying to push it through. That's you working really hard to swing really slow. A good player's going to have this shaft stressed a long ways down, and it's simple to do, if you just follow our Five Step series on focusing on weight shift first, keep your wrists soft. The shaft will stay stressed, and then you'll have something to release down here. When you put this together, with our Five Step series, rotation, weight shift, lead arm, release, all of a sudden, you've got all the key makings for a great RST golf swing. Here's a little real world example from a student who attended the clinic this weekend. We walked them through the RST Five Step system, and using the Orange Whip. You can see what kind of results you can expect when you combine the Five Step system and the Orange Whip together as a training aid. But first I want to show you just really quickly what his swing looked like before. This is literally just right before he used the Orange Whip. As we go back, you're going to see a lot of the typical mid to high handicap tendencies, not a lot of body rotation, starting to reverse pivot here a little bit. This is all just right side dominance, picking the club up with the right arm, the right shoulder. Of course, what you would expect once they load up that right side, they're going to want to start pushing against the shaft. Immediately you see the shafting will starting to widen before he's done anything else. He's throwing club head lag away as his first move, which obviously, not the best move from the top. As he starts down, the angle gets wider and wider. His right shoulder's going to start popping out behind his head, arms are trapped behind his body, losing tons of lag. And then of course you're going to come through with no lag and just have to scoop and push it through, the old baby chicken wing here, lots of chest and body rotation, no body movement, no power in the swing, all of these bad things. This is pretty much the epitome of amateur golf right here in the United States, or worldwide, tons of wide angle here, losing all the shafting, the lag. Now I put him doing our Five Step system. We did weight shift. We worked on body rotation and adding the left arm. Then we just happened to throw the Orange Whip on top of step three with the left arm. Now let's take a look and see what happens. Now, notice how much more he's turning going back. Halfway back, he's almost made his full shoulder turn. That's just part of the Five Step system. It doesn't have anything to do with the training aid, but as you put them together, you can see a huge difference here. Here, he hasn't turned hardly at all. Here, he's made a nice big turn that's getting momentum, creating momentum for the Orange Whip. And that's something you will help feel with the Orange Whip, is that you start making a big turn to help swing your arms, instead of your arms swinging your arms. Then you'll start to feel this big wide swing arc. Here's where the payoff is. Instead of just pushing against the shaft with his right arm, he's starting to work on his weight shift. This is definitely not where we want it to be, but he's just focusing a little bit too much on the left arm and not the lower body. But even still, look at the difference halfway down. We'll put his left arm parallel to the ground. We'll put his left arm parallel to the ground over here. Which one of these golfers would you rather be? This guy? Or this guy? Notice his right shoulder's still back behind his head, so he's keeping his back to the target. For those of you who struggle to keep your back to the target, it's just because you're using your right side too much. Now all of a sudden, he's got more lag than you could possibly imagine. This is more than Sergio Garcia, which again, using this Orange Whip, it helps you feel this, because of the flexion in the shaft. Then as he starts coming down, we'll put him halfway down. Look at that lag. Now he's got lag for days. Hands are actually leading the club at an impact, and then a nice big release, which the orange ball on the end of the shaft helps you feel this nice, good, effortless release. You put the Five Step system together with the Orange Whip, and this is what your golf swing will start to look like. Get Your Free Membership to Finish Watching "The Orange Whip Lag Drill" Right Now!